Aegis is a $1 iPhone app from Hong Kijong that vows to keep your device safe from theft, but suffers from hilarious flaws. Red Alert: Aegis sounds an alarm if someone makes a grab for your iPhone. You can also record your own anti-theft message. The idea is straightforward. When leaving your iPhone unattended—whether on a desk or in your bag—you first launch Aegis and turn on the alarm. If someone then grabs your iPhone or snatches the bag it’s in, a siren (or recording of your own) will sound, halting any would-be thieves in their tracks. 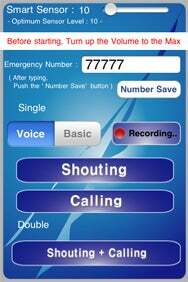 You can also set up the app to call another emergency number of your choosing should the phone get stolen. First, the good news—Aegis does employ some reasonably smart algorithms; the alarm doesn’t go off if your iPhone is merely bumped or jostled. Rather, it needs to detect some clearly intentional movement—in other words, lifting and moving it—to go off. And when the alarm sounds, even tapping the Home button won’t shut the sucker off. Sadly, though, Aegis’s utility is weakened by numerous limitations, not all of which are the developer’s fault. While it’s true that merely exiting the app won’t silence the alarm, turning the iPhone’s volume down—or turning the device itself off—quiets the device before you can shout “Arrest that man!” That’s the biggest weakness of the app’s supposed security, though how thwarted a burglar would be by your iPhone’s siren is a question that I would consider up for debate. Not helping matters are other failings. There’s no official way to disable the alarm should you set it off unintentionally (or recover your iPhone from the would-be criminal). I generally shut it off by quitting the app, double-tapping Home for the multitasking bar, and then holding down on Aegis’s icon to quit the app completely. Also worth noting: you can’t launch the app and then lock your phone; the app actually uses a black screen to simulate the device being asleep, but it’s fully on and using battery because of it. If the bad guy gently taps the Home button on your phone before the alarm goes off in the first place, he’ll have unencumbered access to your data. Finally, arming the alarm from the app’s main screen crashed my iPhone 3GS each time I tried to triple-tap to activate it. Instead, I had to rely on a second screen from which you can also arm the app. It’s a clever idea, but I wouldn’t trust Aegis to protect my iPhone any more than I’d trust a scarecrow to guard my home.